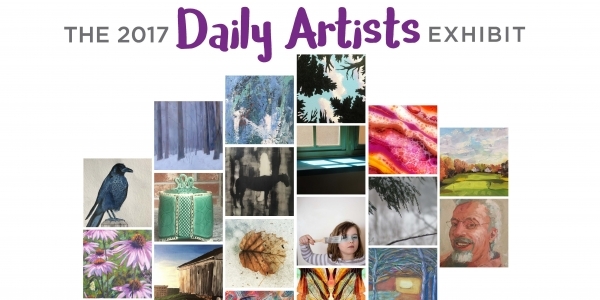 The Daily Artists are a group of local visual artists working in a variety mediums who were committed to the practice of making art daily in 2017. A culminating exhibit of works by The ArtisTree Daily Artists, a group of local artists who have made a year-long commitment to making art each day for the entire year! The Daily Artists are a group of local visual artists working in a variety mediums including painting, drawing, fiber, ceramics, jewelry and photography. Come see the inspiration and growth over yearlong journey of making art daily. 1. Artwork will be DUE in the gallery for drop off on Sunday the 7th 3-5pm and Monday the 8th 4-6pm. please bring the $15 check to ArtisTree for the submission free. 2. Each artists will get a 4 by 4 ft space to display your work in the gallery. Please note that those of you who will not need wall space, just think in terms of pedestal space. 4. Draw out or photograph your ideal arrangement on the wall and developer with your artwork. REMEMBER***Please number and name each item of artwork according to your specific layout photo/drawing. This is imperative to make sure we can easily carry out your vision for the display on your work. 5. Work does NOT have to be framed, BUT needs to be ready to be HUNG on the wall in its condition(for example, it can be matted with wire on back but not in frame...). You can include items like sketchbooks, digital slideshows on iPads, etc. 6. Get creative! Part of this process if to figure out how you want to summarize and display your year's work: what are the main pieces, how do you want them arranged, etc. Please feel free to email JJ (events@artistreevt.org) with any questions. Vermont Arts 2018! A year-long celebration highlighting the stunning array of arts events, concerts, festivals, exhibits, and openings that take place all across the state.